On Monday, July 16th 104 golfers participated in the Credit Unions of Rhode Island Charity Golf Tournament held at Crestwood Country Club. The benefactor of the outing is the Special Olympics of Rhode Island, who is celebrating its 50th Anniversary Year. The Credit Unions of Rhode Island have a tremendous history and wonderful traditions of supporting Special Olympics Rhode Island. In this 50th anniversary year of Special Olympics Rhode Island, it’s fitting that the Credit Unions of Rhode Island have hit the $1-million milestone of supporting SORI and the thousands of athletes who live their dream of competition in the world of sport through Special Olympics. PGE Credit Union was recognized not only as the proud Dinner Sponsor, but also awarded the Top Fundraising Credit Union, based on per member contribution. We thank our members for your continued support of this worthy charity! 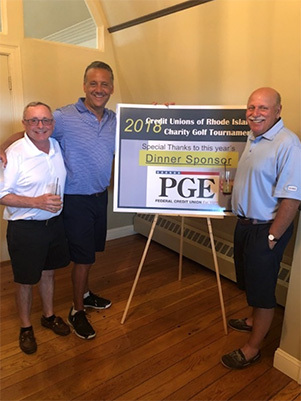 CCUA President Paul Gentile (center) and Navigant Credit Union CEO Gary Furtado (right) thank PGE Federal Credit Union President Ken Poyton for his top sponsorship, as the Dinner Sponsor during the Credit Unions of Rhode Island 2018 Charity Golf Tournament.